The Portland region’s metropolitan planning organization has poked more holes in the I-5 Rose Quarter project. Big ones. In a 7-page letter dated today and sent to Oregon Department of Transportation Project Manager Megan Channell and Federal Highway Administration Environmental Specialist Emily Cline, Metro’s Director of Planning Elissa Gertler tallied a long list of serious concerns with the project’s environmental assessment (EA). Gertler, speaking on behalf of Metro staff, doesn’t directly call for completion of a full environmental impact statement (EIS, a more rigorous analysis as per the National Environmental Policy Act process); but her detailed takedown makes it clear that Metro is not comfortable with ODOT moving forward into the design phase without more comprehensive, detailed analysis of several key components of the project. Metro’s concerns come amid a flurry of bad news for ODOT as numerous organizations — and at least one state legislator (more on that below) — file official comments just before the deadline. Last week we shared the news that The Street Trust, Oregon Walks and Albina Vision Trust have joined the Portland Public School Board, the City of Portland’s bicycle and pedestrian advisory committees and several other organizations in airing serious concerns and calling for a full EIS. Metro has based their response to the EA on several factors including: a lack of analysis of safety impacts, a request to study more design concepts for the freeway lids and other elements of the proposal, a lack of time to fully analyze all available documentation, and concerns about construction impacts. Below are key excerpts from Gertler’s letter (emphases mine). Metro staff believes the EA is inadequate in its evaluation of serious crashes, including documentation of existing conditions and an analysis of how the alternatives compare on reducing serious crashes. This inadequacy means that project designs that can reduce deaths and life changing injuries are not being evaluated, despite direction from federal, state and regional policies. … Metro staff is not aware that the project area is an area of concern for serious crashes when compared to statewide averages. … Not evaluating the relationship of congestion to overall crash rates and serious crash rates raises questions about the design solutions identified to address crashes, which are described as addressing congestion and safety simultaneously. 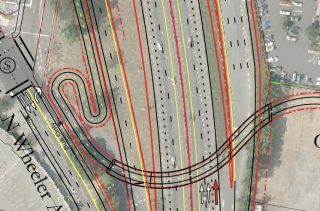 Metro staff also recommends development and evaluation of new design concepts for the highway caps and a segment of Broadway, and has requests and recommendations related to transportation including clarification of analysis, evaluation of different design concepts, and consideration of additional mitigation measures. … There is insufficient information about how well the proposed highway caps will functionally meet the City of Portland’s adopted land use plans. Metro staff believes ODOT and FHWA should better document how the proposed design will provide public open space that offers genuine opportunities for “recreation, relaxation and respite” including details on management and maintenance of these spaces and air quality and noise levels on the caps. There are reasonably foreseeable options to the proposed highway caps that were not explored in the design concept screening process, such as reinforced caps or a tunnel-type structure that could support some forms of development. With more robust construction, capped areas could potentially support low-density construction that could activate what might otherwise be vacant, underutilized spaces; a tunnel-style treatment could potentially support more intensive development that would have a more transformative effect on the district. Further exploration of these design concepts in the environmental process is recommended. The process for releasing the full documentation and analysis within a 45-day review period without any prior review opportunities of technical work did not allow for a full review of the analysis by Metro staff. As the designated Metropolitan Planning Organization for the Portland region and the administrator of the region’s urban growth boundary, Metro staff believes our agency should have been afforded the same opportunity as the City of Portland for prior review of technical reports on land use and transportation. Metro staff’s comments are therefore based on a high level review rather than a complete understanding of the work. The analysis should clearly define any changes in emissions including diesel and greenhouse gases to neighborhoods along the I-5 corridor from North Portland to the South Waterfront/Lair Hill area. 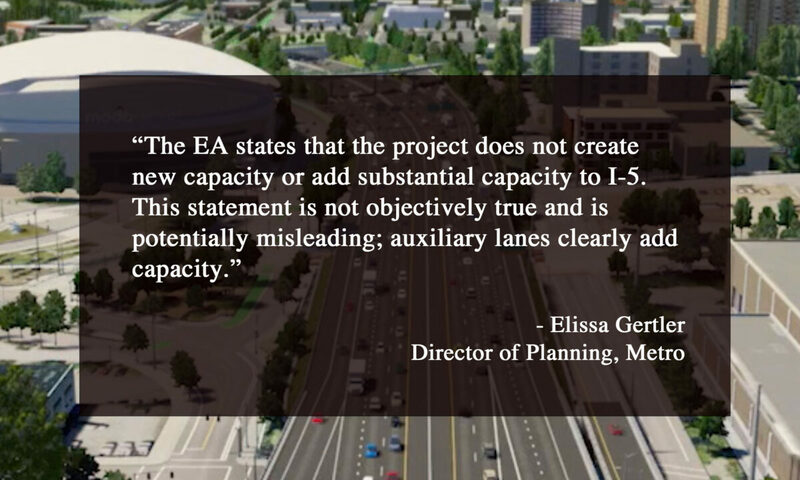 The EA states (section 3.2.2) that the project does not create new capacity or add substantial capacity to I-5. This statement is not objectively true and is potentially misleading; auxiliary lanes clearly add capacity, which can be calculated using Highway Capacity Manual procedures and other traffic analysis tools. The width of Broadway between Williams and 1st is shown as five (5) one-way motor vehicle lanes, which is incompatible with a multimodal, mixed-use environment, and may increase in poor driver behavior. Metro staff requests alternatives to this configuration be developed and further evaluated. 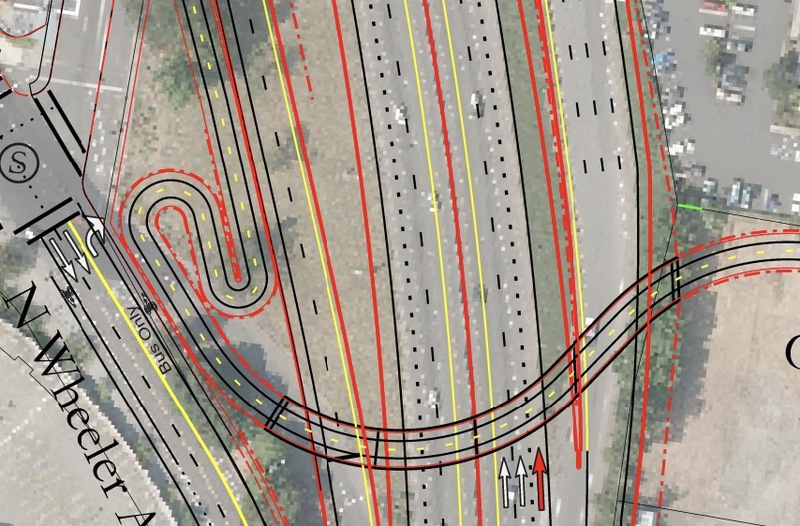 Metro isn’t a fan of indirect switchbacks proposed for Clackamas bridge. The EA does not document whether the project considered the feasibility and cost of retaining both Hancock and Flint as overcrossings. Metro staff requests this scenario be evaluated for consideration. 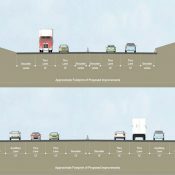 Metro staff recommends the final Clackamas and Hancock bridge designs include direct connections without switchbacks on both sides, as well as consideration of stairway connecting Clackamas to Wheeler to allow more direct non-ADA pedestrian access. Metro staff requests clarification on how the signalization at Williams and Hancock would move bike riders from the right side to the left side, and how bike riders on Vancouver would transition from the right side of the street to the left side prior to Hancock. The EA indicates that bus and streetcar performance will be slowed due to signal phasing changes. Metro staff requests FHWA and ODOT consider additional ways to mitigate this impact, including the consideration of BAT lanes, transit only lanes, and signal modifications (including TSP) on Broadway and Weidler. Metro staff requests the project document how construction-period access will be addressed. Metro Council President Lynn Peterson also sent a letter to ODOT and the FHWA. Her tone was diplomatic. Peterson is playing it safe as she tries to build broad support for a major transportation bond measure Metro plans to bring to voters in 2020. If Peterson were to directly oppose this “congestion relief” project it would hurt her credibility in some parts of the region and make it more difficult to get mayors and other electeds on board. In related news, House Representative Karin Power (D-Milwaukie/Sellwood) has become the first state legislator to call for a full EIS. “For a project of this size, scope, and cost in such a centrally-located neighborhood, Portland deserves to get it right,” Rep. Power added. The EA comment period end today (4/1) at 5:00 pm. UPDATE, 2:45 pm: Sierra Club, Oregon League of Conservation Voters, Center for Sustainable Economy, and Climate Solutions have all signed onto a letter requesting a full EIS based on the EA’s lack of analysis and consideration of congestion pricing. Read the letter here. Woo-hoo! The opposition emerges and grows. You are a major facilitator of this, Mr. Maus. Thank you! 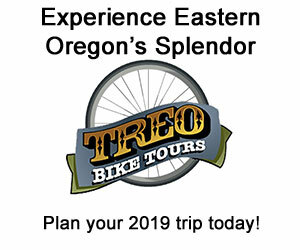 I would speculate what PBOT and TriMet are hoping to leverage something big with this project, especially as Oregon Congressman Peter DeFazio chairs the House Transportation Committee, but it would only be that, pure speculation. Please take into consideration David that the $500 million project includes between $200 & $250 million for related PBOT/Tri-Met projects, or upgrades to Rose Quarter transportation facilities. Knowing that, does that spark a notion as to why neither PBOT, or Tri-Met are opposed to the project? Not really. Given the controversy and lack of EIS, building such a project for even close to $1 Billion is “small potatoes” if governments are failing to boast about why they are doing it, or failing to justify why they aren’t doing their due diligence. If the city and TriMet published big plans with lots of PR to develop a set of huge skyscrapers and an open plaza over the freeway, much like La Defense in Paris, then I could see a bureaucratic justification for doing such a massive project without going through the normal process of an EIS. Or even if the Rose Quarter was about to become the underground hub of a high-speed rail TGV system, as in Frankfurt Airport. I’m not saying it’s justified; in fact it would be immoral and trashes the principal of open transparent government, if it were so, especially in “liberal” Portland Oregon. And of course anyone who owns land nearby will make a killing on their investments, including presumably the city. But when two nationally well-respected public agencies who normally boast about every diverter and bike-protected bus stop they put in, PBOT and TriMet, remain relatively mum about such an expensive and high-profile project, it raises a lot of red flags to those of us who live out-of-state. What are they trying to hide? Why are they acting so out-of-character? Why are they suddenly acting like NCDOT or any other thoroughly disreputable DOT in the USA? Basically, they are being very conspicuous in their silence. So what we have here is that many SOV users, and freight interests are very supportive of the RQ project. Certainly the COP and Rose Quarter private developers are anxious for the project to be done, but it is becoming very controversial. Or so it seems on this site. So why aren’t we talking about the Outer Powell project interim? Maybe we need to start the conversation! Secondly, outer Powell is also very controversial. Yes, it’s already fully funded for at least $110 million in ODOT and other funding (SDC, MTIP, etc. ), but on the north side of Powell is one of the 3 fresh water aqueducts that serve the city (the other 2 are in the center of Division and roughly along Caruthers), so ODOT is still undecided how they are going to actually build sidewalks and protected bike lanes on the north side for a good portion of the project. Only the portion between 122nd and 136th is fully designed and engineered; the rest still needs to be fully designed. And of course it runs through the most ethnically diverse part of Portland and one of the poorest areas to boot (Powellhurst-Gilbert & Centennial), so an EIS is absolutely required. Portland likes this project because it builds a roadway (Hancock-Dixon) into the “Blanchard development site”. The thinking is that that area needs a new road for cars in order to redevelop. The project also builds an important element of the “Green Loop”–the Clackamas structure (though even “Friends of the Green Loop” didn’t want it delivered with this project). Finally, the project improves the main bike routes and creates alternative bike routes that allow people to avoid Broadway-Weidler. It’s all spelled out in the N/NE Quadrant Plan. Such small and wrong-headed baubles to compensate for the “not too bad for a freeway project” freeway project. Nothing nefarious with Portland. No big deals at the federal level. Simply a failure of vision and leadership. David H, apologies if I’m misreading your comment, but to be clear there is no EIS for Outer Powell. Those projects (both the short segment and the long segment in design now) are Categorical Exclusions (CatEx), not EIS projects. The impacts to the community were not seen as significantly negative during the earlier (2014-2016) initial environmental review. FHWA agreed that they would be CatEx projects. Thank you, Let’s Active, your response is very helpful! Federal classification decisions are an art of a sort. There is no template that spits out the “right” one. Some would argue, for example, that the I-205 widening project ($500 million) must be an EA or EIS based on its 7-mile length, cost and roadway/interchange impacts. But it’s a CatEx as agreed by FHWA and ODOT. Debatable, for sure! Why do Portland area official support this? They have been supporting everything consistent with big city type development. That’s why they supported the Pearl District, are behind densification in the CEID district, Barbur Bv. and eventually the Coliseum/S. Albina area. They like big buildings because these generate a lot of property tax revenue. But Portland is discovered now, so this is one of the better ways to deal with that reality. Possibly. Even before Vera Katz certain Portlanders have been dreaming about relocating I-5 underground and eastward, and maybe having a tunnel replace the Marquam Bridge. This would be BIG alright; probably $20 billion for the whole thing. Of course a much simpler—and waaaay cheaper—– solution would be to build some additional bridges over the Columbia, and connect to Washington Co. and also to I-84. But then, of course, this precipitates the mantra of ‘induced demand’ whereas the subterranean I-5 project apparently doesn’t. 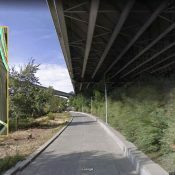 I myself wonder if the project needs to be so wide, if it is simply an attempt to connect the Fremont and the I-84 ramps. My guess, is that it has to be done to the latest federal standards, maybe? Or else, they just want to make sure it is good for a century to come. By then people will probably get everywhere by Star Trek type devices, anyway. Or maybe we will finally have a decent freight rail system, at least. And this is not a “historically black area”; it was largely a Scandinavian area until after the Vanport flood of 1948. Why were the black people living in Vanport? Because they were blocked from buying or renting housing in Portland and Vancouver. Where did they go after the flood? Immediately into N and NE Portland. Check your history again. Vanport was temporary housing during the WW2 effort for Kaiser shipyard workers. It was not designed to be permanent residences.And only 25 percent of the population was black. These were essentially journey workers and not in the US military service—and city leaders had asked all of them to go back to where they had originally emigrated from. However Vanport continued to be federally subsidized and apparently very few of the residents had any intention of leaving. Portland was turning into a rowdy place and eventually Christian feminist Dorothy Lee was elected Mayor on the premise of making Portland safe for women and children. That is why there is a plaque honoring her at City Hall. Dude, I have lived here all my life and know my history. I’m not really a great fan of freeways and was actually alarmed when the 1990 Transportation Plan came out (about 1970). However, let’s not get our wires crossed and start arguing points that are not relevant. Most people in this state would agree that embarking on a huge urban renewal project and not factoring in a long term plan for transportation would be foolish and they are the ones paying ODOT to do the work. I guess if you want to subscribe to some conspiracy theory that the Interstate 5 was a racist concept, you’re welcome to do that. This might be the most “peak white privilege” statement ever posted on BP. And, maybe, you have never owned a Victorian house? 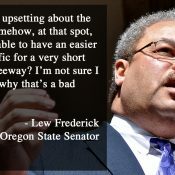 Why keep accusing ODOT of all of this? 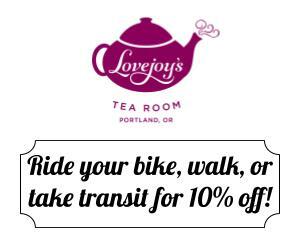 This whole idea was conceived by the Portland Planning Commission ten years ago. This way the city and county governments get to derive a whole bunch of new tax revenue from all of the big buildings that will be built. Maybe you should take your ire to them? Glad to see more people and organizations jumping on board. Sent my comments in late last night – I made it to a four pages before hitting a wall. Unfortunately this EA is so inept that to capture enough of what is wrong takes more than a paragraph or two. There have been a lot of people who have really helped make this comment period effective, including Jonathan, and I want to call that out because this kind of response doesn’t just happen. I agree with Mr. Lascurettes. None of this would have happened with Aaron Brown facilitating NMF, Maus believing in it and giving widespread visibility, and I think Ms. Adams of AVT was the final blow. Thank you to everyone for your advocacy. I am ambivalent about Metro for lots of reasons (starting with: what is this, exactly? )… but of all the governments whose jurisdictions surround my home, it is consistently the most responsive and forward looking. When they send a clear message like this, people should pay attention. More importantly, this is a clear test of ODOT’s extra-democratic power. If the regional planning body raises concerns about the EA, and ODOT pushes through anyway, that’s a bad sign. Also, thank you to my state rep Karin Power! The people that pay attention to Metro are those that agree with them. There are plenty of people that hate Metro because of what they do. True METRO may difficult to get one’s hands around for most citizens…but your could have an MPO that was behind the times and just focused on motorized mobility. ODOT is lying to us. We cannot tolerate this. That’s an interesting idea. For private citizen comments perhaps they should be weighted based on the share of road usage they pay for through taxes, fees, etc. Drivers would seem to lose in that scheme as they pay for much less than 100% of their road usage. Meanwhile people on foot, bike, and utilizing transit pay far of the transportation network than they use. While it isn’t really possible right now since we don’t have a mechanism to measure all of that data, this would prevent ODOT from proposing projects that primarily benefit a constituency (drivers) dependent upon a form of welfare. Only white, male, land owners should be able to participate in our political process. Make that “white, male, Protestant landowners”. Can’t have non-conformists participating in the democratic process. Most Protestants are “non-conformists”, except those who conform to the state religion, which in the UK during the American Revolution was Anglican/Episcopalians and Presbyterians – only they were allowed to be commissioned officers, MPs, judges, etc. Ha ha ha ha ha ha ha ha ha ha ha ha, oh that hoary chestnut NEVER gets old! Comedy gold. “The Oregon Department of Transportation will collect just over $5.3 billion in total revenue during the 2017–2019 biennium. 23 percent from the federal government. 77 percent from state sources– the state fuels tax, taxes on heavy trucks, driver and motor vehicle fees, and bond proceeds and Certificates of Participation. So, I pay federal and state income taxes, pay vehicle fee on two motor vehicles and fuels taxes using them. As well as homeowner property taxes and bond fees. I also paid the specific BIKE TAX last year for a purchased bike meant to quiet ignorant attitudes about fairness in infrastructure (ironically on a bike meant for off-road use). So do I need to start smoking and playing video poker in my spare time from my trucking company as well to have a voice in your opinion? Otherwise everything you think is “road taxes” I already pay IN ABUNDANCE. I don’t think much of your income tax or property tax is going to roads. But I agree that the parent comment is BS. HK, it depends on if the road is an ODOT road or a county/city road. The inputs to the budgets vary greatly. How much does road tax pay for police traffic control, enforcement, and fire/medical emergency response? If drivers actually paid for roads, they would also pay for sidewalks, bikeways, and crosswalks because obviously crossing the street wouldn’t be a problem without cars. If we subsidize your gasoline at $2 a gallon (it’s considerably more than that, but I’m just throwing a number out) and you pay 50 cents a gallon in “tax”, you aren’t paying a tax on gasoline. I’ve replaced some car trips with cycling, walking and transit and have fuel efficient small vehicles. They’ll also be the last fossil fuel burning vehicles I buy. I didn’t lobby for the current rate of taxes and would be happy to pay the unsubsidized fuel costs drivers pay elsewhere in the world as long as they equitably go toward road maintenance and to mitigate the effects of fossil fuels on heath, the environment and investment in green energy technologies. Please tell me how much a “fair share” is. I hear the term a lot but I have never seen a number attached to it. It depends on what you drive and how much you drive. Generally speaking, the more you drive the more you are being subsidized. Some of this information has been presented here many times — I don’t see what purpose it would serve to look this information up for you again. Being subsidized by whom? I rarely drive; do I subsidize you when you drive? If so, by what mechanism? You’re unfamiliar with federal taxes? Externalities? Deferred environmental & health costs? Look at Egypt or Venezuela to see what a real subsidy looks like. This includes many externalities, but does not include subsidies for vehicle production, which I’ve seen estimated at up to $2900 per vehicle, or roads, which we all know are not paid for by ‘gas taxes’. Can you show me some information about how much of Oregon’s roads are paid for by non-vehicle based funds? I think the actual answer is “I am sure I pay MY fair share and I am sure everyone does not”. Only women are running this one. I think there is a sense in which “no change in capacity” is true. If you count the number of cars that I-5 is able to move from Alberta down to Terwilliger at peak travel times adding that lane through the Rose Quarter will make no difference whatsoever. In order for that lane change to make an impact, the Rose Quarter would have to be the only choke point on the north/south system. As it is, even if you completely eliminated the Rose Quarter choke point, all you will do is get to the Marquam Bridge tail back sooner, which will make the Marquam Bridge back up longer and still give you no decrease in travel time or increase in capacity. The other thing that might be improved is west to east travel time. But the problem there isn’t the I-5 throughput at the Rose Quarter, it’s that the Banfield is already stuffed full of cars and is at peak capacity. Adding another lane at the Rose Quarter won’t change the fact that the Banfield is stuffed full of cars at peak travel time and will do nothing to increase capacity. The only benefit I can see is a decrease in travel time and when traffic is moderate to heavy, but under peak capacity. Peak capacity will not change on either the Banfield or I-5 by adding a lane through the Rose Quarter. That being the case, why are we planning to spend $500 million on a project with so little benefit? As someone who does a fair amount of workflow analysis and Lean/SixSigma work, I really appreciate your assessment of the situation. Given the current possible thoughput, it’s still going to be gridlocked regardless. 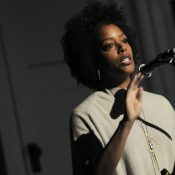 This project is simply establishing a bridgehead, so to speak. Thanks, man. I think a shorter version of what I wrote is that downstream from the Rose Quarter both south and east, the pipe is full and the flow rate is fixed. Nothing you do upstream will make a difference in peak capacity. No. I have not. I’ve asked Councilor González for a copy. If anyone else has seen this letter, please send it to me. Jonathan the “reply” function isn’t working for me, sorry to make a new thread. Mr. González quote tweeted his original tweet and said he mischaracterized the letter. WWeek is taking his tweet to mean he personally supports the full EIS. Just to be clear… As I suspected, Councilor González misspoke in his tweet about Metro Council “unanimously supporting an EIS”. He has corrected his tweet. The only letters from Metro are the two included in this story. Also important to note that even given their strong rebuke of the EA, Metro is not directly calling for an EIS. Metro calling for a full EIS and raising these issues this late in the game strikes me as seriously hypocritical. Fixing the I-5 bottleneck in the Rose Quarter area was one of three issues identified TWENTY years ago. (The other two were the constriction adjacent to Delta Park (widened by one lane southbound) and the Interstate Bridge (killed).) There have been countless studies done relating to the I-5 corridor and multiple updates of Metro’s Regional Transportation Plan (RTP); the bottleneck in the Rose Quarter has gotten worse as predicted. I don’t know which version of the RTP was the first to include this project, but it has certainly been included in the RTP for years. It’s identified as project 11176 in the current RTP adopted by Metro in December 2018. Metro’s a planning agency; planning without end meets their needs, so I guess I’m not surprised that they call for more study. I’m not saying that there isn’t room for some improvements to the project, but it seems most here are of the BANANA approach. Build Absolutely Nothing ANywhere Anytime. “…it seems most here are of the BANANA approach. Build Absolutely Nothing ANywhere Anytime.” Do you believe this to be a factual statement, or are you just trying to get a rise out of people? don’t Build Anything Near Anything that’s Near Anything else. Your argument is 20 years ago some people at Metro thought this project was a decent idea, and that it’s hypocritical to raise concerns now. While those people who thought 20 years ago are probably no longer at Metro, isn’t changing one’s mind a strength? And you’re in the know enough to understand some projects just hang out in the RTP unfunded forever, because they’re lower priority. Hypocrisy is saying one thing while believing another (though a more contemporary understanding includes acting differently than one has stated one believes). I don’t think this falls into either of those categories. Metro is raising important issues. Have they been addressed in all those “countless studies” you refer to? Or not? Do you think spending $500,000,000+ is something that’s worth doing carefully? I think people here are of the “Build Those Things That Meet More of Our Goals” approach. This project doesn’t show it meets many of our goals. I’m out. 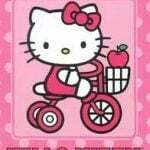 Kitty, seriously…you believe fuel taxes cover all road building and rebuilding? Fuel taxes, no. Fuel taxes plus other vehicle-related use fees? Maybe. I don’t want to argue, I just want to see your data. I’ve posted mine, several times. Maybe start by proving that ‘fuel taxes’ are greater than fuel subsidies before you include them. I’ve already provided numbers that indicate otherwise, which you continue to ignore. Generations after us may marvel at how we generously and silently funded our own demise while bragging about token user fees. The spreadsheet you posted earlier is a little confusing, but it seems to be primarily externalities and things like “forgone tax revenue”. If your argument is that because of climate change, the cost of Oregon’s road network is borne by the general tax payer (who is, incidentally, very likely to be a driver), I find it unconvincing. The fact remains that the data I’ve seen and posted suggests that the road network is largely paid for directly by users, and the idea that bicyclists pay for it via their income taxes and property taxes is not actually true. I will remain open to data showing that it is. I also readily acknowledge that there are huge externalities in our use of fossil fuels, and totally 100% completely support internalizing these costs and making users pay to mitigate the damage they do. Thanks for the coverage of this. It feels like I have been trying to wrap my mind around this project forever, but it certainly doesn’t seem like the best Portland can do.